Are you hunting for a big and powerful blender that can pulverize virtually anything and make large quantities of smoothies? If so, you might want to take a closer look at the Nutri Ninja BL680A. It looks powerful and massive. It requires a lot of counter and storing space. It has smart Auto-IQ technology, that can do almost anything at the push of a button and an easy-to-read LCD display. The controls are intuitive and easy to use. All components are made from high quality materials and it should work as designed for years. Overall a powerful blender that can make single serving smoothies and huge batches of almost anything using smart technology! 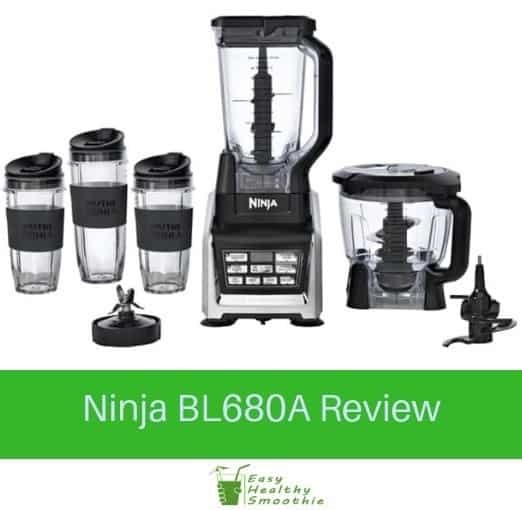 If you need a super powerful and large blender that can handle large quantities of pretty much any ingredient out there, the Nutri Ninja BL680A might be the right blender for you. Yes, this blender is big, massive in fact. There are a lot of large parts included here, so it’s not something you want to get if you have limited space, as you will need a lot of countertop and storage space to house it. It is a great item to have for parties, especially if the demand for daiquiris is high. With that being said, the Nutri Ninja BL680A can handle frozen foods, ice, hot foods, and pretty much anything in between. The only thing it really can’t do is grind up dry foods into powders, but other than that, when it comes to making nutrient-rich drinks, smoothies, milkshakes, protein shakes, and other such things, this blender works like a charm. It’s a good choice for anyone who wants to be health conscious, or for anybody that just really loves drinking smoothies and milkshakes. When you buy the Nutri Ninja BL680A, you get a few different parts. For one, you get a super powerful 1500-watt base. In other words, the power level here is very high, more than enough to blast through ice and anything else in the path of the blades. The base has quite a few different functions, which is always nice. The Nutri Ninja BL680A comes with a large 64-oz. blending container, as well as an even larger 72-oz. container, which means that you can definitely make large quantities of smoothies at once. You also get 3 drinking cups included with this blender. What is convenient is that if you only want to make a single-size serving, the smaller blender cups actually screw right onto the blades, thus allowing you to blend your smoothies inside of the portable cups. The cups also come with silicone grip sleeves and easy-sip lids for a high level of portability. This blender also comes with various blades with differing purposes and strengths. In terms of features, the Nutri Ninja BL680A does have quite a few of them. First and foremost, the very best feature here is the smart Auto-IQ technology which this blender comes with. It might sound really fancy, which it is, because this blender has intelligent processing. This means that with the simple push of a button, this blender will combine pulsing, blending, and pausing for the creamiest and best-mixed smoothies around. Of course, you can also manually blend or pulse the ingredients, which is convenient. On that same note, the Nutri Ninja BL680A also comes with an auto countdown timer, which can also count upwards if need be, thus providing for awesome results every single time. The easy-to-read LCD display is a good addition. Besides that, the Nutri Ninja BL680A can blend ice into snow, it can extract nutrients from seeds, and yes, it can make some really nice smoothies. The Nutri Ninja BL680A also comes with a fairly good warranty, a big bonus no doubt. The bottom line is that if you need a big and powerful blender for all of your needs, the Nutri Ninja BL680A is a great way to go. It has 2 large blending jars, 3 drinking cups with lids, super sharp blades, and a whole lot of power. Yes, it is quite pricey, not to mention big and bulky, so it’s not ideal for people who will only use it on occasion to make single-serving smoothies. However, if you need something big and powerful for large quantities, as well as for individual, single-sized servings, the Nutri Ninja BL680A is a nice option to keep in mind.